2 1. 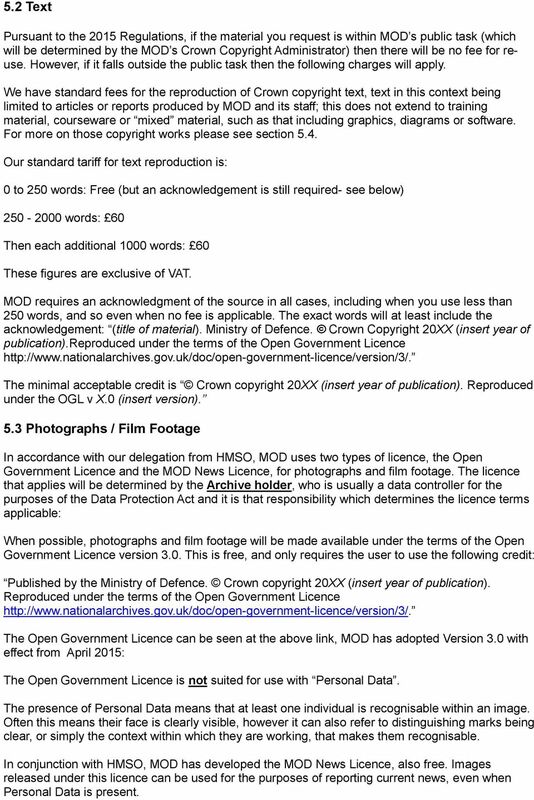 MOD Copyright Statement The Ministry of Defence (MOD) is a Crown body. The qualifying copyright works both civilian and military MOD staff produce are subject to Crown copyright, which is managed through a delegation from the Controller of Her Majesty's Stationery Office (HMSO), the Office of Public Sector Information, part of The National Archives by Defence Intellectual Property Rights (DIPR), a specialist team within MOD s Central Legal Services (CLS) division. For more information on Crown copyright please visit The National Archives website The material featured on the MOD pages of the.gov.uk website is protected by Crown copyright unless otherwise indicated. This material may be reproduced for the purposes of non-commercial research or private study and for the purposes of reporting current events only, unless other terms are set out against the respective content. This means you should check the terms carefully before assuming it is acceptable for you to copy and/ or re-use the material. Any reproduction of this material for any purpose must be acknowledged as shown in the following way: (title of material). Ministry of Defence. Crown Copyright (year of publication). Reproduced under the terms of the Open Government Licence The minimal acceptable credit is Crown copyright 20XX (insert year), reproduced under the OGL v X.0 (insert version.) In general, Crown copyright material may not be used or reproduced for any other purpose than those set out in these Copyright Licensing Information notes without first obtaining permission from DIPR. This permission will be in the form of a copyright licence and may require the payment of a licence fee. 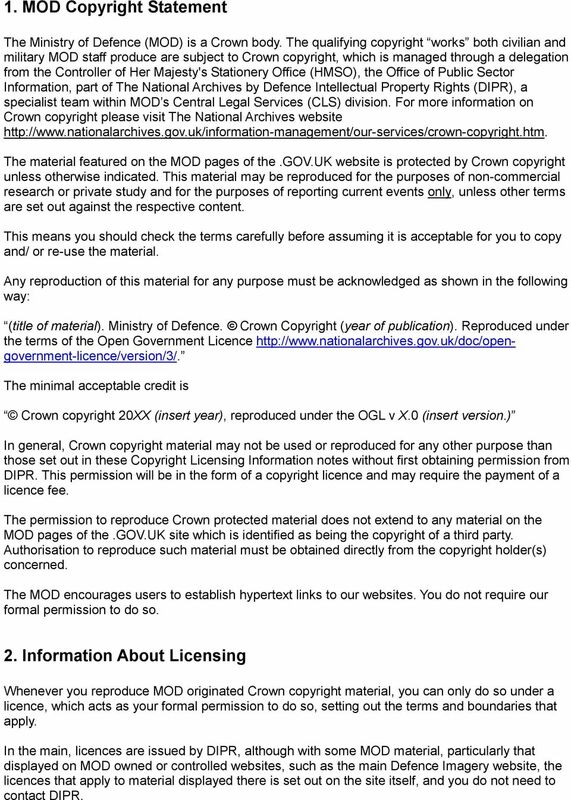 The permission to reproduce Crown protected material does not extend to any material on the MOD pages of the.gov.uk site which is identified as being the copyright of a third party. Authorisation to reproduce such material must be obtained directly from the copyright holder(s) concerned. The MOD encourages users to establish hypertext links to our websites. You do not require our formal permission to do so. 2. 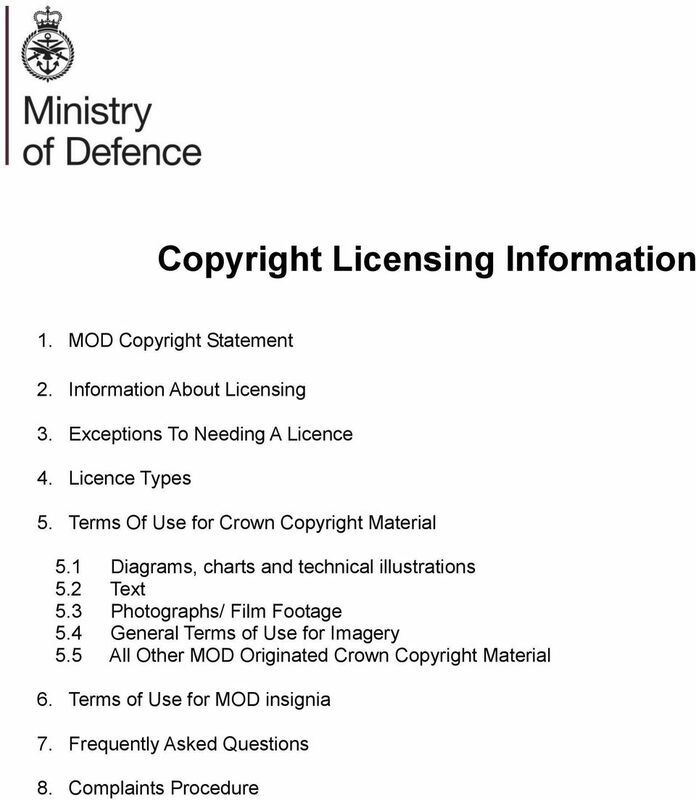 Information About Licensing Whenever you reproduce MOD originated Crown copyright material, you can only do so under a licence, which acts as your formal permission to do so, setting out the terms and boundaries that apply. In the main, licences are issued by DIPR, although with some MOD material, particularly that displayed on MOD owned or controlled websites, such as the main Defence Imagery website, the licences that apply to material displayed there is set out on the site itself, and you do not need to contact DIPR. 3 3. Exceptions To Needing A Licence: You do NOT need a licence to copy: 1) MOD originated Crown copyright material that is proven to have been published more than 50 years ago, subject to the following exceptions, ie the following may NOT be copied: (a) Material protected by other intellectual property rights, such as trademarks or registered designs (which include the badges, crests and logos of the MOD and HM Armed Forces ie the Royal Navy, the Army and the Royal Air Force, including their sub-units, eg for the Army, regimental insignia, for the Royal Air Force, squadron badges); (b) Material produced by third parties, where the copyright has been acquired by the MOD, unless otherwise stated against the content in question; (c) Material that has not been commercially published, and is less than 125 years old; 2) Material already covered by a Copyright Licensing Agency (CLA) licence. Extracts of Crown copyright magazines, books and journals may be copied by CLA licence holders, subject to the terms of their licence. Please remember however that maps, hydrographic charts and sheet music are not covered by CLA licences. 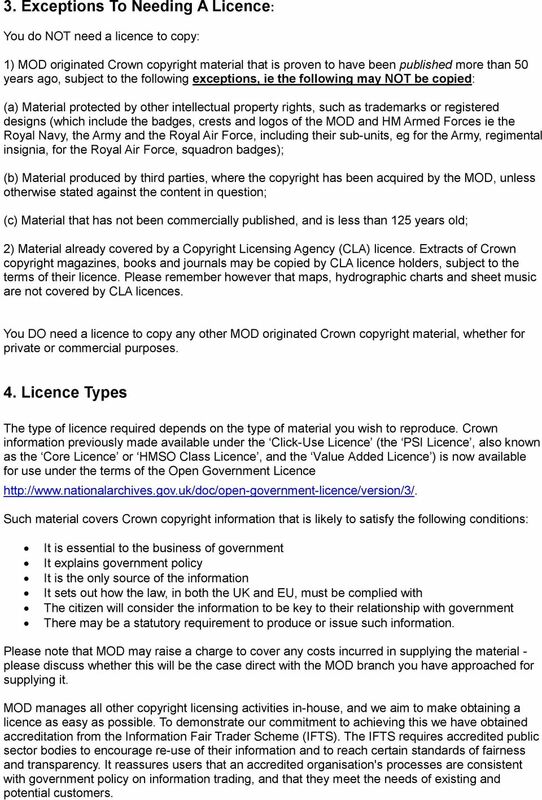 You DO need a licence to copy any other MOD originated Crown copyright material, whether for private or commercial purposes. 4. Licence Types The type of licence required depends on the type of material you wish to reproduce. Crown information previously made available under the Click-Use Licence (the PSI Licence, also known as the Core Licence or HMSO Class Licence, and the Value Added Licence ) is now available for use under the terms of the Open Government Licence Such material covers Crown copyright information that is likely to satisfy the following conditions: It is essential to the business of government It explains government policy It is the only source of the information It sets out how the law, in both the UK and EU, must be complied with The citizen will consider the information to be key to their relationship with government There may be a statutory requirement to produce or issue such information. Please note that MOD may raise a charge to cover any costs incurred in supplying the material - please discuss whether this will be the case direct with the MOD branch you have approached for supplying it. MOD manages all other copyright licensing activities in-house, and we aim to make obtaining a licence as easy as possible. To demonstrate our commitment to achieving this we have obtained accreditation from the Information Fair Trader Scheme (IFTS). The IFTS requires accredited public sector bodies to encourage re-use of their information and to reach certain standards of fairness and transparency. It reassures users that an accredited organisation's processes are consistent with government policy on information trading, and that they meet the needs of existing and potential customers. 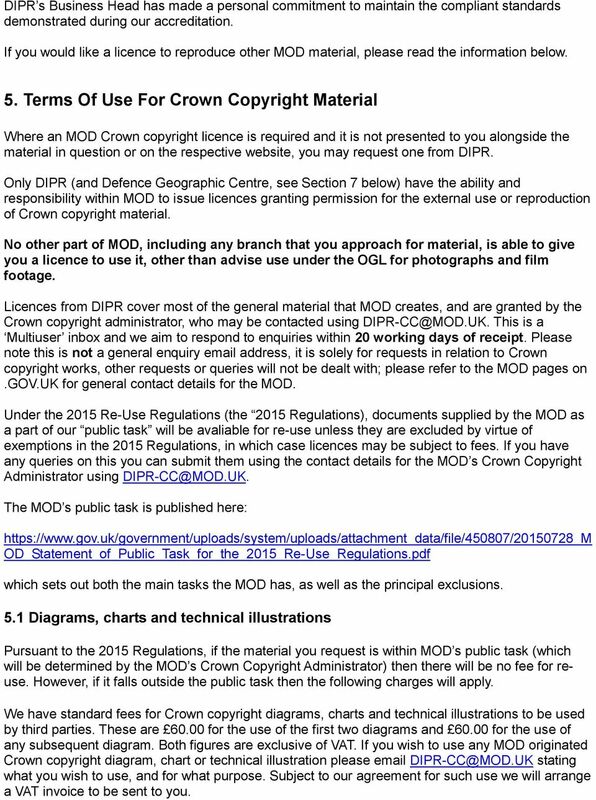 5 5.2 Text Pursuant to the 2015 Regulations, if the material you request is within MOD s public task (which will be determined by the MOD s Crown Copyright Administrator) then there will be no fee for reuse. However, if it falls outside the public task then the following charges will apply. We have standard fees for the reproduction of Crown copyright text, text in this context being limited to articles or reports produced by MOD and its staff; this does not extend to training material, courseware or mixed material, such as that including graphics, diagrams or software. For more on those copyright works please see section 5.4. Our standard tariff for text reproduction is: 0 to 250 words: Free (but an acknowledgement is still required- see below) words: 60 Then each additional 1000 words: 60 These figures are exclusive of VAT. MOD requires an acknowledgment of the source in all cases, including when you use less than 250 words, and so even when no fee is applicable. The exact words will at least include the acknowledgement: (title of material). Ministry of Defence. Crown Copyright 20XX (insert year of publication).reproduced under the terms of the Open Government Licence The minimal acceptable credit is Crown copyright 20XX (insert year of publication). Reproduced under the OGL v X.0 (insert version). 5.3 Photographs / Film Footage In accordance with our delegation from HMSO, MOD uses two types of licence, the Open Government Licence and the MOD News Licence, for photographs and film footage. The licence that applies will be determined by the Archive holder, who is usually a data controller for the purposes of the Data Protection Act and it is that responsibility which determines the licence terms applicable: When possible, photographs and film footage will be made available under the terms of the Open Government Licence version 3.0. This is free, and only requires the user to use the following credit: Published by the Ministry of Defence. Crown copyright 20XX (insert year of publication). Reproduced under the terms of the Open Government Licence The Open Government Licence can be seen at the above link, MOD has adopted Version 3.0 with effect from April 2015: The Open Government Licence is not suited for use with Personal Data. The presence of Personal Data means that at least one individual is recognisable within an image. Often this means their face is clearly visible, however it can also refer to distinguishing marks being clear, or simply the context within which they are working, that makes them recognisable. In conjunction with HMSO, MOD has developed the MOD News Licence, also free. Images released under this licence can be used for the purposes of reporting current news, even when Personal Data is present. 6 Such images CANNOT be used for any other purpose, and no debate will be entered in to about this. The user should use the following credit: Crown copyright 20XX (insert year of publication), reproduced under the MOD News Licence v3.0. The MOD News Licence can be seen here: ce_v3.pdf The MOD maintains a publicly accessible source of photographs - the Defence Imagery Website, which can be found here: On this site you will find a large number of images which can be viewed without charge or special software, over the internet. Information is provided detailing which images are available under which licence and how hi-resolution copies can be obtained. As an example, a green tick is shown adjacent images to which the Open Government Licence applies, to indicate broad use is possible. Images which contain Personal Data or other restrictions are denoted with a red exclamation mark indicating to a user that there are limitations as to use, in which case only the MOD News Licence terms apply. Images where the MOD News Licence is applicable are clearly marked or identified by the releasing party within MOD. The three Services also run their own imagery sites. If you wish to use these images you will need the Archive holder to confirm it is MOD originated Crown copyright and has been checked for Personal Data before it can be used under the Open Government Licence. In addition to this, it is sometimes possible to obtain copies of MOD originated Crown copyright photographs or film footage from other archive holders within the Department. If you have obtained such an image and wish to use it, again you will need the Archive holder to confirm it is MOD originated Crown copyright and that it does not contain Personal Data before it can be used under the Open Government Licence. DIPR will not be able to do this for you, so please do not ask. It may also be possible to obtain copies of MOD originated Crown copyright photographs from sources outside the MOD. If you have obtained such an image and wish to use it, you will need to be able to confirm (eg by an official stamp on the back or a recognisable MOD reference) that it is MOD originated Crown copyright. DIPR may then be able to offer you licence terms to use it. However DIPR will not be able to do so for images containing Personal Data, so please do not ask. For instances where you have copies of photographs where the original Archive holder is unknown or the unit has been disbanded please see the previous paragraph. 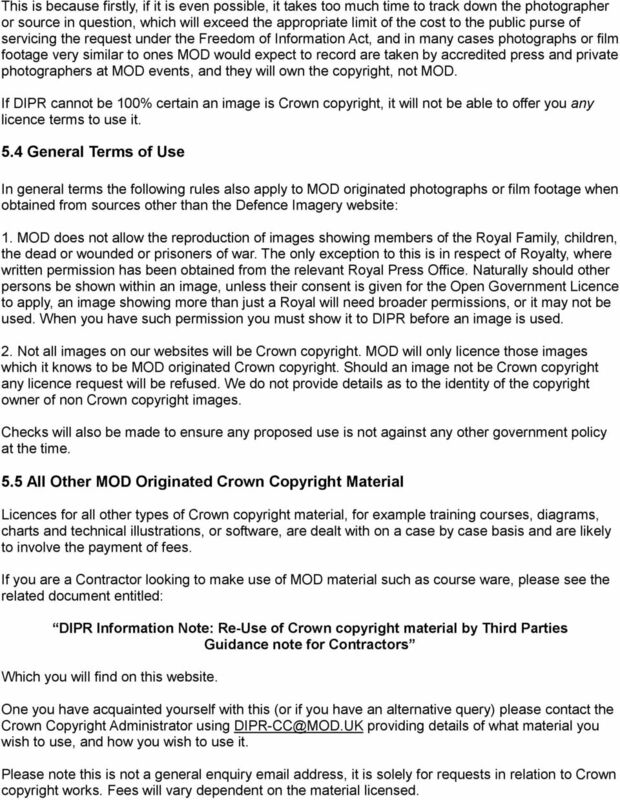 To be clear on this: DIPR is unable to confirm if images merely presented to it are MOD originated Crown copyright. 9 If you wish to use a MOD badge, crest or logo on a website, within a publication or for an informational purpose please search this website for the licence terms entitled LICENCE AGREEMENT for the use of SOME Ministry of Defence Logos for SPECIFIED AND LIMITED PURPOSES ONLY If you wish to use a MOD badge, crest or logo for the purpose of a book cover you will require a licence which will incur payment of a fee. This will be for use on a front cover, for use of a back cover and for use on a spine. Please note these are cumulative fees, ie if you wish to put a logo on a front and rear cover of the same publication, the charges will be 200 _ 100, ie 300. These figures are exclusive of VAT. Any use approved will also have a size restriction so that there can be no indication that the product has official approval ie that the insignia is being used as an illustration rather than to show a connection with MOD, the Royal Navy, the Army or the Royal Air Force. Please contact the Crown Copyright Administrator using providing details of what material you wish to use and how you wish to use it. Please note this is not a general enquiry address, it is solely for requests in relation to Crown copyright works. If you wish to use a MOD badge, crest or logo on MERCHANDISE Those who wish to produce merchandise (items being made available for sale or even to give away) MAY NOT use MOD badges, crests or logos on an item unless they have either; entered in to a formal merchandising licence with DIPR, or; are buying items for sale or to give away from a company who already has a licence. Guidance is set out in our document entitled Armed Forces Officially Licensed Products Please search this website for a copy, and its associated application form and business plan entitled: OLP Editable App + Business Plan Should you wish to proceed with an application to do this. 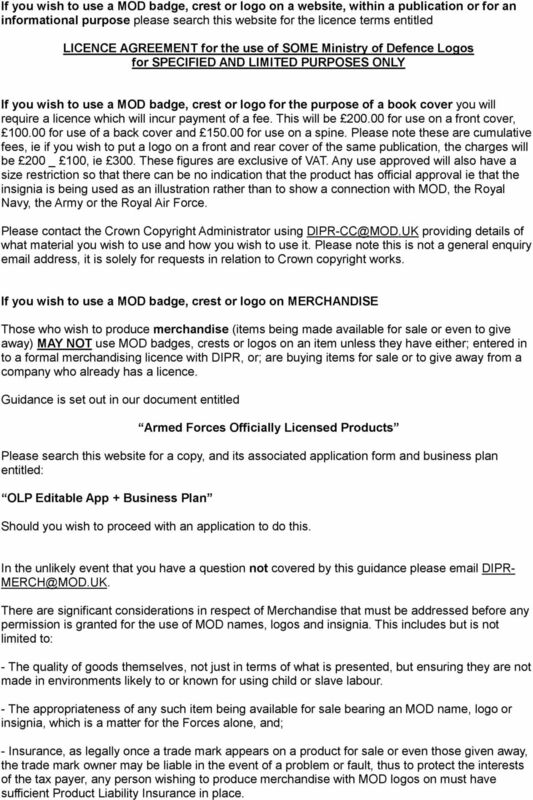 In the unlikely event that you have a question not covered by this guidance please DIPR- There are significant considerations in respect of Merchandise that must be addressed before any permission is granted for the use of MOD names, logos and insignia. This includes but is not limited to: - The quality of goods themselves, not just in terms of what is presented, but ensuring they are not made in environments likely to or known for using child or slave labour. - The appropriateness of any such item being available for sale bearing an MOD name, logo or insignia, which is a matter for the Forces alone, and; - Insurance, as legally once a trade mark appears on a product for sale or even those given away, the trade mark owner may be liable in the event of a problem or fault, thus to protect the interests of the tax payer, any person wishing to produce merchandise with MOD logos on must have sufficient Product Liability Insurance in place. 10 As a consequence there is a full application process, requiring commitment from a party who wishes to do this, and there is no guarantee MOD will approve any proposal. 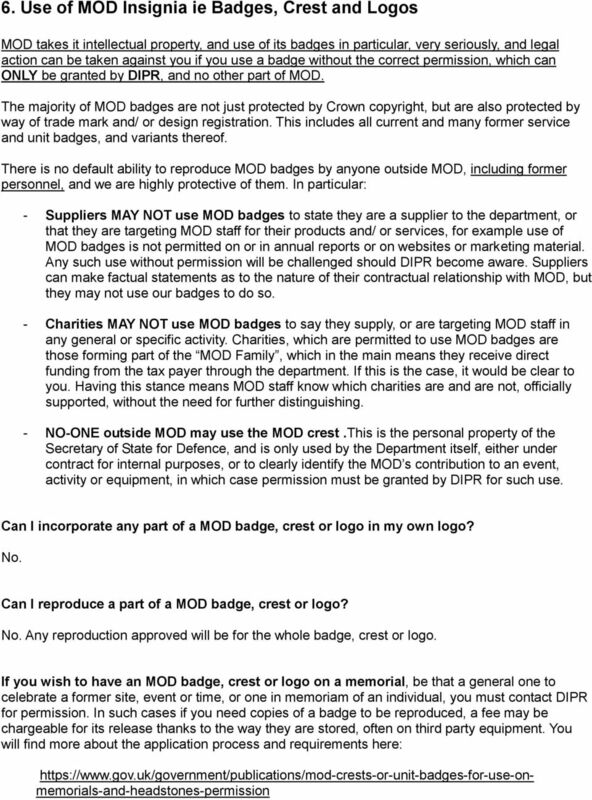 If you wish to use a MOD badge, crest or logo on a website, within a publication or for an informational purpose please search this website for the licence terms entitled: LICENCE AGREEMENT for the use of SOME Ministry of Defence Logos for SPECIFIED AND LIMITED PURPOSES ONLY 7. Frequently Asked Questions: How is your policy compatible with the stance on Open Government Data? MOD makes as much data available as it can without charge, including photos and film footage, as well as contributions of datasets to data.gov.uk. As MOD has a delegation from the Controller of Her Majesty s Stationery Office, we are permitted to charge when it is reasonable to do so, and diverting MOD personnel from their core tasks to do this (or where people are employed directly to do this) results in a cost to the tax payer, and it is wholly reasonable to recover that. Why does MOD not charge for images and film footage, but does for other things? MOD simply records too many images and too much film footage to make it value for money to the tax payer to charge third parties for their re-use. Put simply it costs MOD more to collect the money than it could reasonably charge. Instead it is more practical for MOD to offer all third parties standard licence terms for them. MOD is in the business of defending the realm, and any request for alternative copyright material, such as diagrams, software, text, training courses etc, diverts MOD staff from our core activities, thus it is reasonable for the tax payer to expect a return on such activity. The charging of fees also enables MOD to recover some of the costs involved in producing this material. Our IFTS accreditation commits MOD to set fair charges for use of its Crown copyright material,. In general, charges are set in line with either standard pan-government rates, prevailing commercial market rates, or for the MOD to recover the cost of work in issuing a licence. I represent a Charity/Not for profit organisation - do I still have to pay fees? Yes. In accordance with the Re-use of Public Sector Information Regulations 2005, requests from charities must be treated in the same way as requests from any other organisation. This means that fees will apply where applicable. Furthermore, in line with our commitment to fair and equitable charging, we are unable to offer preferential terms to charities whose purpose is to support causes associated with the Armed Forces. All requests for re-use of information received by the MOD will be treated equally. In addition, please note that MOD is unable to waive charges in lieu of payments to charity. Can DIPR help me to locate and obtain MOD material? 11 No. 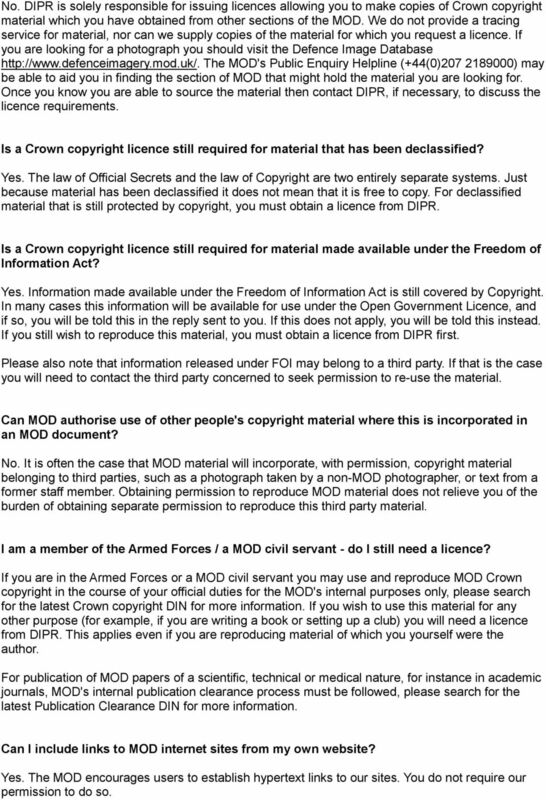 DIPR is solely responsible for issuing licences allowing you to make copies of Crown copyright material which you have obtained from other sections of the MOD. We do not provide a tracing service for material, nor can we supply copies of the material for which you request a licence. If you are looking for a photograph you should visit the Defence Image Database The MOD's Public Enquiry Helpline (+44(0) ) may be able to aid you in finding the section of MOD that might hold the material you are looking for. Once you know you are able to source the material then contact DIPR, if necessary, to discuss the licence requirements. Is a Crown copyright licence still required for material that has been declassified? Yes. The law of Official Secrets and the law of Copyright are two entirely separate systems. Just because material has been declassified it does not mean that it is free to copy. For declassified material that is still protected by copyright, you must obtain a licence from DIPR. Is a Crown copyright licence still required for material made available under the Freedom of Information Act? Yes. Information made available under the Freedom of Information Act is still covered by Copyright. In many cases this information will be available for use under the Open Government Licence, and if so, you will be told this in the reply sent to you. If this does not apply, you will be told this instead. If you still wish to reproduce this material, you must obtain a licence from DIPR first. Please also note that information released under FOI may belong to a third party. If that is the case you will need to contact the third party concerned to seek permission to re-use the material. Can MOD authorise use of other people's copyright material where this is incorporated in an MOD document? No. It is often the case that MOD material will incorporate, with permission, copyright material belonging to third parties, such as a photograph taken by a non-mod photographer, or text from a former staff member. Obtaining permission to reproduce MOD material does not relieve you of the burden of obtaining separate permission to reproduce this third party material. I am a member of the Armed Forces / a MOD civil servant - do I still need a licence? If you are in the Armed Forces or a MOD civil servant you may use and reproduce MOD Crown copyright in the course of your official duties for the MOD's internal purposes only, please search for the latest Crown copyright DIN for more information. If you wish to use this material for any other purpose (for example, if you are writing a book or setting up a club) you will need a licence from DIPR. This applies even if you are reproducing material of which you yourself were the author. For publication of MOD papers of a scientific, technical or medical nature, for instance in academic journals, MOD's internal publication clearance process must be followed, please search for the latest Publication Clearance DIN for more information. Can I include links to MOD internet sites from my own website? Yes. The MOD encourages users to establish hypertext links to our sites. You do not require our permission to do so. 12 Is there any MOD information that cannot be licensed through DIPR? Yes. The licensing of information produced by the following area of MOD, its agencies and trading funds is dealt with in-house by each of these organisations, please see each organisation's website for further details: Defence Geographic Centre, including Military Survey, maps and cartographic data, geospatial information, intelligence, aerial photography and imagery. Contact: DGC, Copyright and Release Branch, MacLeod Building, Elmwood Avenue, Feltham, Middlesex TW13 7AH, Tel: Fax: Defence Science and Technology Laboratory (DSTL) - covering scientific and technology solutions underpinning the UK's defence and security capability. UK Hydrographic Office - covering Admiralty Charts, Admiralty publications, tide tables and hydrographic data. Met Office - covering Met Office weather forecasts and meteorological data. 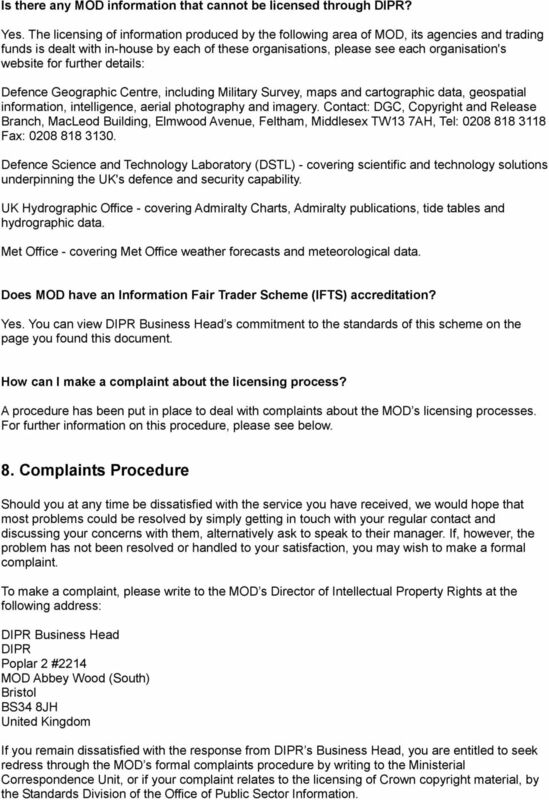 Does MOD have an Information Fair Trader Scheme (IFTS) accreditation? Yes. You can view DIPR Business Head s commitment to the standards of this scheme on the page you found this document. How can I make a complaint about the licensing process? A procedure has been put in place to deal with complaints about the MOD s licensing processes. For further information on this procedure, please see below. 8. Complaints Procedure Should you at any time be dissatisfied with the service you have received, we would hope that most problems could be resolved by simply getting in touch with your regular contact and discussing your concerns with them, alternatively ask to speak to their manager. If, however, the problem has not been resolved or handled to your satisfaction, you may wish to make a formal complaint. To make a complaint, please write to the MOD s Director of Intellectual Property Rights at the following address: DIPR Business Head DIPR Poplar 2 #2214 MOD Abbey Wood (South) Bristol BS34 8JH United Kingdom If you remain dissatisfied with the response from DIPR s Business Head, you are entitled to seek redress through the MOD s formal complaints procedure by writing to the Ministerial Correspondence Unit, or if your complaint relates to the licensing of Crown copyright material, by the Standards Division of the Office of Public Sector Information. Us, our and we: The Quality Assurance Agency for Higher Education (QAA). Co-operative Energy, Co-operative House Warwick Technology Park, Warwick CV34 6DA. Portfolio Investments Key Features Including the Investments ISA IMPORTANT INFORMATION YOU NEED TO READ AND UNDERSTAND BEFORE YOU INVEST The Financial Conduct Authority is a financial services regulator. Terms and Conditions for Membership and Use, between Heritage Matrimonials and the Customer, and any Third Party. SELF-Directed Nationwide customer agreement Customers not receiving advice This important document describes the terms and conditions that will apply if you invest on a selfdirected basis without advice. Guide 1 What is records management? How often do you see that? Giving us a meter reading when we begin supplying you is important. This reading lets us bill you accurately from the start. PAGE 1 of 5 VIRTUAL OFFICE APPLICATION FORM Our Virtual Office service provides you with a prestige Central London address and 0207 telephone number, with your mail and calls handled securely and professionally. Reference to any statutory provisions in this Agreement shall include any statutory provisions, which amends or replaces it.